Full support for MySQL, Oracle, PostgreSQL, Microsoft SQL Server, Microsoft Access, IBM DB2, SQLite, Firebird, Sybase, SAP MaxDB, Informix, HSQLDB and H2 database management systems. Refer to the wiki for an exhaustive breakdown of the features. You can download the latest zipball or tarball. Material around sqlmap presented at conferences. All code contributions are greatly appreciated. First off, clone the Git repository, read the user's manual carefully, go through the code yourself and drop us an email if you are having a hard time grasping its structure and meaning. Each patch should make one logical change. Please follow the existing stylistic conventions: wrap code to 76 columns when possible. Avoid tabs, use four space characters instead. Before you put time into a non-trivial patch, it is worth discussing it privately by email. Many people have contributed in different ways to the sqlmap development. You can be the next! sqlmap is the result of numerous hours of passionated work from a small team of computer security enthusiasts. If you appreciated our work and you want to see sqlmap kept being developed, please consider making a donation to our efforts via PayPal to donations@sqlmap.org. We also accept Ƀitcoins to 1AUrrKYsamBEThdruYTQmUfMfLF7aaxU6x. Copyright © 2006-2019 by Bernardo Damele Assumpcao Guimaraes and Miroslav Stampar. All rights reserved. This program is free software; you may redistribute and/or modify it under the terms of the GNU General Public License as published by the Free Software Foundation; Version 2 (or later) with the clarifications and exceptions described in the license file. This guarantees your right to use, modify, and redistribute this software under certain conditions. If you wish to embed sqlmap technology into proprietary software, we sell alternative licenses (contact sales@sqlmap.org). This program is distributed in the hope that it will be useful, but WITHOUT ANY WARRANTY; without even the implied warranty of MERCHANTABILITY or FITNESS FOR A PARTICULAR PURPOSE. See the GNU General Public License v2.0 for more details at http://www.gnu.org/licenses/gpl-2.0.html. 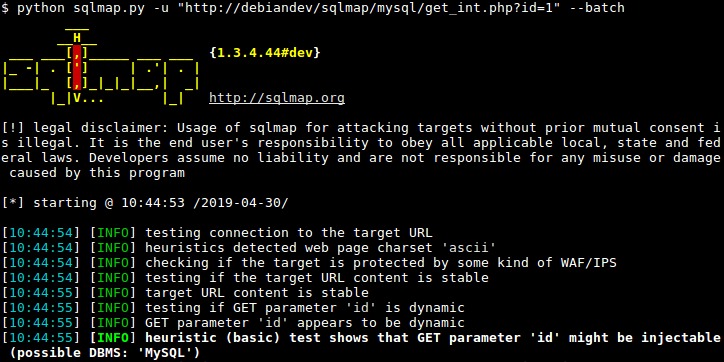 Usage of sqlmap for attacking targets without prior mutual consent is illegal. It is the end user's responsibility to obey all applicable local, state and federal laws. Developers assume no liability and are not responsible for any misuse or damage caused by this program. You can contact the development team by writing to dev@sqlmap.org.